Company says tailgates can fly open for no reason. 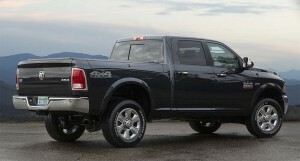 Fiat Chrysler is recalling more than 1.4 million Ram pickups due to a tailgate lock problem. Fiat Chrysler is recalling more than 1.1 million Ram pickups in the U.S. to repair the locks on their tailgates that could allow the door to fly open while the truck is being driven. The company issued a recall to fix the power-locking mechanisms in the tailgates of certain trucks. The recall affects certain Ram 1500, 2500 and 3500 pickup trucks from the 2015 through 2017 model years with 5-foot 7-inch and 6-foot 4-inch cargo beds. Pickups with manual tailgate locks and trucks with 8-foot cargo beds are not affected. The recently redesigned 2019 Ram is also not affected. Engineers installed a different system for that model. The company said it had not identified any injuries or accidents connected to the defect. FCA says the tailgate actuator limiter tab could break and cause the tailgate to unlatch and open while driving, spilling cargo into the road and causing an accident. It will notify customers when service becomes available, expected to start Sept. 14. It will repair the problem at dealerships free of charge. About 1.14 million of the affected trucks are in the U.S., but more than 260,300 were sold in Canada and nearly 45,000 will be subject to recalls in Mexico and outside the NAFTA region. This entry was posted on Thursday, August 2nd, 2018 at and is filed under Automakers, Automobiles, FCA, Markets, NAFTA, Pickups, Ram, Recalls, Safety, U.S./North America. You can follow any responses to this entry through the RSS 2.0 feed. Both comments and pings are currently closed.